EAS Energy; Athletics; Strength. Body for Life 20 g high protein 25 vitamins and minerals. Naturally and artificially flavored. EAS, is a pioneer in sports nutrition products for athletes and fitness enthusiasts. Recognizing these advances in sports nutrition, today thousands of professional athletes and fitness enthusiasts in over 50 countries choose EAS to help satisfy their nutritional needs. Don\'t waste your workout; Take within 30 minutes after your workout, the 20g of high quality protein in Myoplex Lite helps you refuel and build lean muscle. Myoplex products are also available in convenient, delicious bars and ready-to-drink shakes. 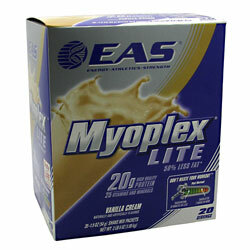 Myplpex Lite has 1/2 the fat of Myoplex Original. Mypoplex Lite-1.5g fat. Myoplex Original--3.0g. Ingredients: MyoPro Protein Blend (Calcium Caseinate, Whey Protein Concentrate, Soy Protein Isolate, Whey Protein Isolate, Taurine, L-Glutamine), Corn Maltodextrin, Oat Fiber, Natural And Artificial Flavors, Calcium Phosphate, Vitamin And mineral Blend (Magnesium Oxide, Ascorbic Acid, dl-Alpha Tocopheryl Acetate, Niacinamide, Ferrous Fumarate, Zinc Oxide, Calcium Pantothenate, Manganese Gluconate, Copper Sulfate, Boron Proteinate, Pyridoxine Hydrochloride, Riboflavin, Thiamin Hydrochloride, Vitamin A Palmitate, Folic Acid, Biotin, Chromium Citrate, Potassium Iodide, Molybdenum Amino Acid Chelate, Selenuim Amino Acid Chelate, Cyanocobalamin), Calcium Citrate, Potassium Chloride, Sodium Phosphate, Medium Chain Triglycerides, Dairy Creamer (Sunflower Oil, Corn Syrup Solids, Sodium Caseinate, Mono And Diglycerides, Soy Lecithin), Carrageenan, Potassium Phosphate, Salt (Sodium Chloride), Xanthan Gum, ACesulfame Potassium, Ascorbic Acid, Sucralose And Beta-Carotene. Ingredients: Ingredients: MyoPro Protein Blend (Calcium Caseinate, Whey Protein Concentrate, Soy Protein Isolate, Whey Protein Isolate, Taurine, L-Glutamine), Corn Maltodextrin, Oat Fiber, Natural And Artificial Flavors, Calcium Phosphate, Vitamin And mineral Blend (Magnesium Oxide, Ascorbic Acid, dl-Alpha Tocopheryl Acetate, Niacinamide, Ferrous Fumarate, Zinc Oxide, Calcium Pantothenate, Manganese Gluconate, Copper Sulfate, Boron Proteinate, Pyridoxine Hydrochloride, Riboflavin, Thiamin Hydrochloride, Vitamin A Palmitate, Folic Acid, Biotin, Chromium Citrate, Potassium Iodide, Molybdenum Amino Acid Chelate, Selenuim Amino Acid Chelate, Cyanocobalamin), Calcium Citrate, Potassium Chloride, Sodium Phosphate, Medium Chain Triglycerides, Dairy Creamer (Sunflower Oil, Corn Syrup Solids, Sodium Caseinate, Mono And Diglycerides, Soy Lecithin), Carrageenan, Potassium Phosphate, Salt (Sodium Chloride), Xanthan Gum, ACesulfame Potassium, Ascorbic Acid, Sucralose And Beta-Carotene.